The Museum der Moderne Salzburg used to consist only of the Rupertinum Art Museum between the Franziskanerkirche and the Festival Halls, but recently it was extended and now occupies a new site on the Mönchsberg. It is dedicated to pot-war and contemporary art. It aims to be a link between artists and viewers, between Austrian and International art. The new museum overlooks the city from one of the best spots of Salzburg and occupies four floors. This includs the museum restaurant "Mönchsberg 32" with a terrace that provides visitors with a great view. If you are not interested in modern art, the view itself is rewarding enough to go there! 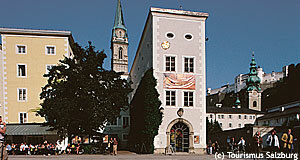 The "Rupertinum" is the older sister of the Museum der Moderne Salzburg. As the MMS, it is owned by the federal province of Salzburg. Since 1983, it occupies a Baroque townhouse in the heart of the city, to the opposite of the Franziskanerkirche. It focuses on graphics, but changing exhibitions tend to have themes from a variety of different art forms.